Made for the girl who loves her glow, Nykaa Glow Getter Highlighting & Illuminating Duo features two luminescent shades that reflect light to give you an amplified radiance. Its one of a kind formula creates an unparalleled, creamy feel that glides on to your skin seamlessly in an elegant finish. Never cakey, never gritty, this lush highlighter duo is all the spotlight you'll ever need! Explore the entire range of Highlighters available on Nykaa. 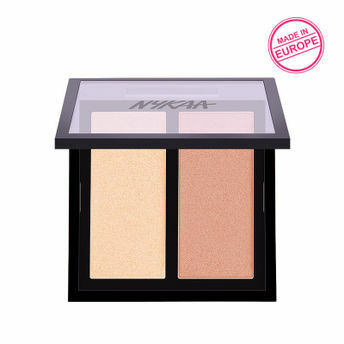 Shop more Nykaa Cosmetics products here.You can browse through the complete world of Nykaa Cosmetics Highlighters .Alternatively, you can also find many more products from the Nykaa Glow Getter Highlighting & Illuminating Duo range.